What's more important to you in a game--slick special effects, or a compelling story line? If you're more interested in a good story than fancy animation, then give The Blackwell Legacy ($15, free demo) a try. The folks at Wadjet Eye Games clearly put a lot of thought into the narrative, and they recruited talented voice actors to bring the characters to life. However, the graphics are blocky and the game plays out in a small box on screen. More important, the interface is less than intuitive and there's no Help file (at least in the demo). For example, a dossier concerning Rosa's aunt is delivered. Click on the package, however, and it disappears. It took me a while to figure out that I had to mouse to the top of the window to get to the inventory, and then right-click the item to open it. At one point Rosa says that there are photos within the dossier, but I never did figure out how to access them. 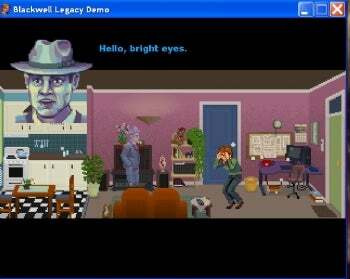 The Blackwell Legacy demo is a stand-alone executable file that gives you a good idea of what the game involves, but it is more of an advertisement than a game. If you enjoy a good mystery, though, this demo may well convince you to shell out $15 for the download.